Basics-Time to head to the mines! 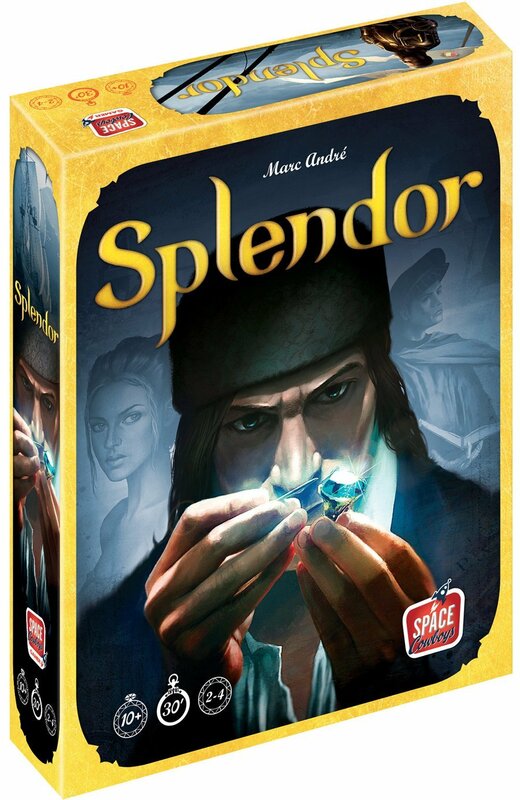 In Splendor, you play a gem merchant trading gems to gather mines while trying to impress the nobility. At the beginning of the game, a number of noble characters are drawn equal to the number of players plus one. Then, three decks of cards are shuffled, and three cards from each deck are displayed. These decks all have different gems in them with one decking having cheap gems worth little to no points, another with middle value gems it in, and the final deck having the most expensive and highest point gems in it. Below the gem decks are placed poker chips with the five different kinds of gems on them. Each turn, players take actions to gather gem tokens or spend gem tokens to buy gem cards. Each gem card has a cost in other gems on it. The cheapest gems normally require between three and five gems, while the most expensive gems requiring over 10 gems. On a players turn, a player can take one of four actions: gather three different gem chips, gather two gem chips of the same type if four gems of the same type are available, reserve a card by placing it face down in front of the player and taking a gold (wild card) token, and finally spending gem tokens to buy a gem card from reserve or from the available cards. When a gem car is purchased, another is drawn from the deck. This game has an engine building component as each gem card purchased has a gem on it. Any purchased gem cards can be used in place of a gem token when purchasing another gem card on a one-for-one basis without having to discard or return the card. Thus, building up your gem cards makes it easier to buy gems in the future. Some gem cards have points on them, which are added to your point total. Also, each noble drawn at the start of the game has a number of different gem types and amounts on them. When you have that same number of gems and types of gems as the noble, you get that noble and their points for free on your turn. When one player gets 15 points, play continues until every player has an equal number of rounds. Then the player with the most points is the best gem merchant and is the winner!